Wednesday March 6th 2013 was shearing day........Judy Shelley, shearer and her husband Steve were here this afternoon to trim hoofs and shear off the woolly coats of the flock. Some shepherds like to shear after lambing, I prefer before. It improves my ability to see body condition and monitor udder development in anticipation of lambing. With lambing in April it is not as cold and with no wool coats on the sheep, it is actually warmer in the barn. Sunday March 17, 2013. Everyone got their yearly Tasvax 8 vaccination today. The 19 day count down to lambing has began. Maybe someone will be early and give us a Easter morning lamb. Fingers are crossed. Sunday March 23, 2013. The redwing black bird has returned to the farm. A true sign of SPRING !!!!!!!! Monday April 8 2013. We are still waiting on the ewes to start lambing. A couple of the ewes look ready to drop any second. Today is a mild day and would be perfect. But I am sure they will wait till the wee hours of the morning. They always do. Till then I will have to keep my excitement somewhat contained. Friday April 12, 2013. We have been busy for the last 36 hours lambing. Two sets of twins. 3 rams and 1 ewe. Sunday April 21, 2013. A beautiful day at ITSA BREEZE FARM today. Two more ewes have lambed.....two more ram lambs. We now have a total of 5 ram lambs and 1 ewe lamb. Two more ewes to lamb......here's hoping for twins and ewe lambs. Thinking my luck is not so good this lambing season for ewe lambs. Wednesday May 1 2013. We have had two more ram lambs. These little guys are black. Both are doing well. One more ewe to go. Thinking it will be another ram. Tuesday May 7, 2013. The last ewe lambed this morning. Another ram lamb, black. A very big boy for a Babydoll...12lbs. All lambings for 2013 were unassited births. Awesome for the ewes and even better for me. the year of the ewe lamb. Monday August 19, 2013. We have official sold all of our 2013 lambs. Time to start thinking about next years lambs. The waiting list for 2014 has already begun and filling up quickly. I hope to be breeding 11 ewes this fall and praying for a higher ewe to ram lamb ratio. So for those of you who are considering ewe lamb(s) you best contact me soon. Enjoy the rest of your summer everyone!!! Tuesday October 15 2013. Well it has certainly been a rainy summer. Fall seems to be better. The rams are happy boys as of yesterday.....they are with their appointed ewes. Looking forward to lambs to be born starting the middle of March 2014. Sunday December 15,2013. We here at the farm are wishing you all a very Merry Christmas and Happy New Year. Winter has come in with a roar. Finger crossed ........ the rams are offically finished and the ewes now have little darlings (ewe lambs I hope) to nurture for their March arrival. Friday January 24, 2014. Another windy ccccold day here. This is one hell of a winter this year. We hope you all are keeping warm. Today was our annual vet visit for OSHP certification, vaccinations for all horses, dogs and cats and overall preventative flock health visit. Dr. Rob Swackhammer was happy with the animals' health, enviroment conditions and Bio-security. We enjoy seeing and working with Dr. Rob Swackhammer....an excellent vet. Although I hope not to see him till next year. Wednesday March 12, 2014. Will winter ever end. We are waiting patiently for lambing to start. I think they have the right idea.....lets wait till spring. All seem healthy and growing bigger. In fact they are extra affectionate. Monday March 24, 2014. Well it has a been a busy few days. Most of the ewes have lambed now. Only a couple more to go. OMG they are so cute. Poor things have to endure my constant hugs. I will be contacting all who are on the waiting list in the next couple of weeks. The ram ewe ratio is much better this year. Friday March 28 2014. We are still waiting on one ewe to lamb. She will be at least another 10 plus days. She must have been bred during the last heat cycle when the rams were still in with the ewes. This is a picture of some of the lambs from this year. We have been blessed with two rams lambs and 10 ewe lambs this year. 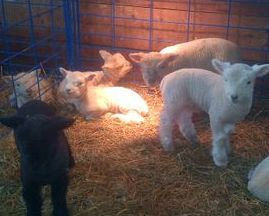 This includes three sets of twin lambs and three black ewe lambs. The black ewe lambs were singletons. Saturday April 19 2014. Hope everyone is having a fantastic Easter holiday weekend. It is a sunny day here but still a bit chilly. We are offically finished lambing and the last one was a ram lamb whom is not spoken for as of yet. I will be posting pictures of any available lambs at the end of the month. There are still a couple of ewe lambs that I might consider selling. Anyone who is yet to get their deposit in, please do so asap, as there are others who are anxious to know if a lamb is available for them. Tuesday July 1 2014. Happy Canada everyone. A hot and sticky one here. We are currently cutting hay. First cut on south corner field turned out well last week. Here's hoping south east field and east field turn out just as well this week. We have acquired two new rams this year to change up the genetics in the flock. One comes from here in Ontario and the other from Saskatchewan. There is also a new LGD named Hunter to help Breezer. We have not had any loses and we hope to keep it that way. We will have to get some pictures on here of our new farm family members. Take care everyone and have a fantastic summer. Monday November 3 2014. Well another summer has gone by and fall is almost done. I really don't want to think about winter. As I don't want to go through the same winter as last year. The rams are happy boys as they are with their appointed ewes. We are hoping for another successful lambing this coming spring 2015. The ewes should start lambing the first of April 2015. I am off to a healthy flock seminar this week. Hoping to learn lots and confirm that I am on the right track of maintaining a healthy flock. Have a FANTASTIC holiday season everyone. Sunday January 11 2015. Well another holiday season has whipped by. The girls were home from school and it was so nice to have a home full of excitement. Even all the animals were happy to see them. Well the next couple of months are filled with lots of preparation for 2015. First to get organized for my yearly health flock certification visit from our vet. Next making sure I have everything I need for lambing and booking the shearing in for March. Then setting up the lambing pens. Lambing to begin in April. I always get excited with the anticipation for these little cuties. So much work and lack of sleep......but so satisfying. To all whom have been looking for pictures of our newer farm family members, I apologize for not getting that done. I am lousy at picture taking. As for the healthy flock seminar in November, it was very good. I am on the right track and learnt more to keep our flock healthy. Sunday February 22 2015. Well we have completed for another year our Ontario Sheep Health Program. Now to get the the barn ready for lambing and give all the sheep their yearly vaccination and pre-lambing worming. Plus shearing and hoof trimming. So thankful we are not lambing yet as temperatures are to go to -28C with windchill of -42C tonight. Sunday April 12 2015. What a beautiful day. Lots of fresh air today for myself and the sheep. Lambing has been going well. Should be finished in a couple of weeks. For those on the waiting list I will be contacting you soon. Also for anyone who has tried to access this web site I am sorry you have had difficulties. I am not pleased with this site provider. Sunday May 31 2015. Well we are getting a much needed rain, (grow hay grow), but yuck it is chilly today. 4C just does not seem right. It could be worse....snow. Anyway finally got to getting those pictures of available lambs posted for this year. Too many cuties, hard not to keep them all. Well I did decide to keep a couple. Monday June 29 2015. So now we are getting too much rain. Haying is tricky. Although the bit we have done is awesome. Very happy with it. Now if we can just get the rest off looking and smelling that good. I am all ready thinking of late fall breeding season. Figuring out which ewes will go with which ram. Two new rams to try. Wondering how they will do. Hope everyone has a great Canada Day holiday!! Friday November 13 2015. Well summer is over and fall is quickly moving into winter. We are all very sad here. 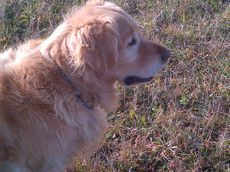 Our 14 year old Golden Retriever has past away this past week. We had rescued him when he was 18 months. He loved helping when the lambs were born, always wanting to make sure they were okay. He also loved riding on the four wheeler, going to the family cottage. Always greeted everyone with a waging tail and talked. We also lost our 14 year old Cocker Spaniel mix the end of August. He was my faithful barn chore helper and he was a better mouser then any cat. He came to us a 6 month old rescue. We will love you forever Cody and Mojo. Tuesday December 23 2015, So winter is official here according to the calendar. Yet the weather here is very mild. I am sure it will be colder come lambing time. Lambing will be happening the middle of February with the crossbred ewes first. Babydolls will be lambing in April. As always I love the anticipation of lambs. Merry Christmas and Happy New Year to all!!! Saturday January 30 2016, We are currently having a little mild spell but I am sure it will get cold again. Spring is a couple months away yet. So I am crazy this year. Did not want to wait till March/April lambs. In stead I have chosen to breed my Coopworth crossbred ewes for a mid February lambing. Babydolls will following with mid April lambing. So I am starting to get excited as a couple of the Coopworth crossbreds have started to develop an udder. Time to get those lambing pens up and ready to go. The Coopworth crossbreds have had their yearly tasvax8 vaccinations and pre lambing worming. Babydolls will be done mid March. As I wait and monitor the progress of the Coopworth cross I will be getting my paperwork in order for my OSHP audit and visit from my vet for my yearly renewal and certification. All this helps keep away the 'winter blues'. Sunday February 21 2016, Well winter has been mild and very little snow. I keep waiting for the big storm. Not that I really want it. We had our first lamb of 2016 yesterday. A bouncing baby ram lamb at 10lbs. This was a first time ewe and she was very tired. But some molasses water gave her that little something extra she needed to get her energy back. I did feel sorry for her though, that was a big baby for a first timer. Thursday March 10 2016, These are the first twins born (brother and sister) for the lambing season of 2016. The little ram lamb was not accepted by his mother right away. I would have to intervene ever couple of hours so that mom would let the little guy nurse. After almost 24 hours of assisting the little guy mom finally accepted him. Mom still favours the ewe lamb but will now let the ram lamb nurse without me monitoring. Still more crossbred ewes to lamb. Babydoll ewes to lamb the middle of April. Glad we have mild weather. Less change of having to worry about hypothermia. Lots of work this time of year but satisfying work. Love it. Saturday April 23 2016. Spring....I love spring. Flowers are great but lambs are better. Lambing is almost complete. Just a few laggers. I guess I am not allowed a full night's sleep just yet. This year has been a 50/50 split on colour and gender but not much luck in creating breeding groups. It has also been a huge learning curve for me. In the six years of lambing I had never had to help a ewe lamb. Well this year is making up for it. The lambs have been 8 pounds and up. Except for on set of twins. Plus the biggest issue has been nose first and one or both legs back. With the help of my shepherd mentor and close friend, her excellent patience and teaching skills have taught me how to remain calm and assist the ewe to a successful delivery. WOW .... it is a great adrenaline rush. Thank God you can't see me dancing around with delight. I did have a bad moment though. I was to late at one of night checks and the lamb was too big with legs back. My first lamb loss. I knew it would happen one day but it still does not make the feeling of failure and sadness of loss any less. Wednesday October 5, 2016 Fall already.....where has the summer gone. Can't believe I am already planning for fall breeding. Ewes are currently on their flushing program. Rams are getting conditioned as well. By the end of the month everyone should be with their selected breeding group. So by mid April we should be in full swing of lambing. Hope everyone has a wonderful Thanksgiving weekend with family and friends. Monday November 21, 2016 Technically it is still Fall for another month. Hard to believe that just a couple of days ago it was 18C. This morning it is -11C with wind chill. I know it will get colder yet but, these old bones are not ready for the cold weather. Our fall breeding is in full swing and I am already excited for spring lambing. A few more things to winterized out and about the farm then I can focus on getting ready for the holiday season. On that thought we here at the farm wish you all a wonderful and safe holiday season.  Sunday February 19,2017 What a beautiful weekend. A tease of spring. I have been exceptional busy this winter with many aspects of life that has kept me from my duties of responding to emails. So I apologize to all thous whom I have neglected to respond to. Shearing will be the end of March and lambing is to begin in late April. We have bred 30 ewes this year. Three different rams with the Babydolls. Hopefully spring is not to far away. So looking forward to it. Saturday March 25, 2017 Well spring seems to be here with a little bit of winter nosing in every now and then. All the flock got their vaccinations and worming last week. Saw a few little udders started. Shearing is next. Then setting up lambing pens. 30 ewes bred so a busy end of April coming. By then spring should be fully here. Happy Spring and Easter everyone. Saturday May 4 2017 April showers have come the first of May. Thankfully fields are over saturated but no flooding here. Lambing is now finished and all are growing and playing happily. As soon as I sort through all the cuteness of whom is spoken for I will post those whom are available. All registered Babydoll ewes are sold. There will be a couple of 50% ewes available and there are registered Babydoll ram lambs for sure. Enjoy your May flowers everyone. Friday January 12 2018. Well the latter half of 2017 was good for the farm and all its animals. I on the other hand, I have been put to the test. My mother has had serveral health issues and this has taken me off farm alot. She is to turn 90 this coming May and still lives on her own. Except goes no where on her own. Her mind is remarkable which is a good thing (sometimes to remarkable). So as my childern leave the nest, (the eldest is getting married in June) My plate becomes fuller as care giver to my mother who wishes to remain living on her own. I have been most thankfull for my hubby's assistance in looking after the animals these past few months. I am looking forward to my daughter's wedding in June and of course for all the cuteness that will be born the end of April. Take care everyone, only 68 more days till the first day of SPRING!!!!! Friday April 13 2018. Found this poem on the internet. Love it!!! !